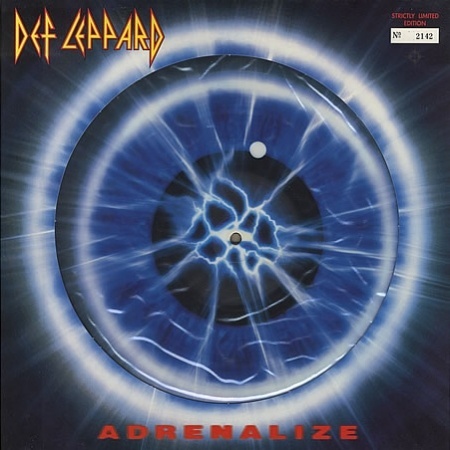 Def Leppard's classic Adrenalize album was released in limited edition picture disc form in the UK on this day in 1992. 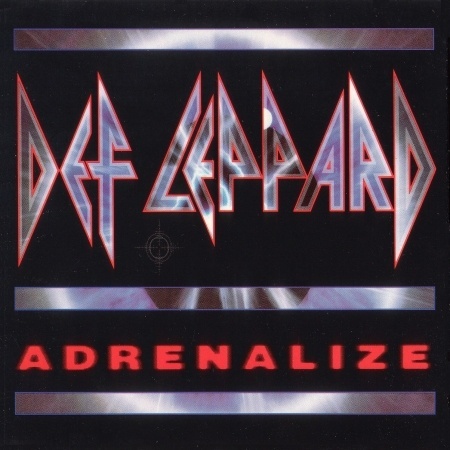 The original Adrenalize album had been released on 30th March 1992 in the UK. It was released again in time for Christmas 1992 as two limited edition picture discs. The first being a 10 track picture disc LP version featuring the original album and custom album artwork on the front. 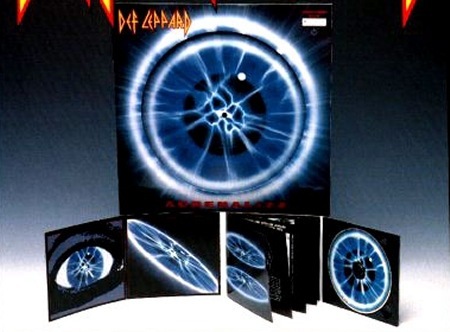 The second of only three Def Leppard album picture discs ever released in the UK. The other release was a 5,000 copies only numbered picture disc CD digipak. This CD had the original album plus two bonus tracks. 'Miss You In A Heartbeat' was the version already issued on the MLLAM CD single in June 1992. The other track 'She's Too Tough' was released for the very first time on this picture disc. It would be released again just over a month later in January 1993 as one of the extra tracks on the 'Heaven Is' single. 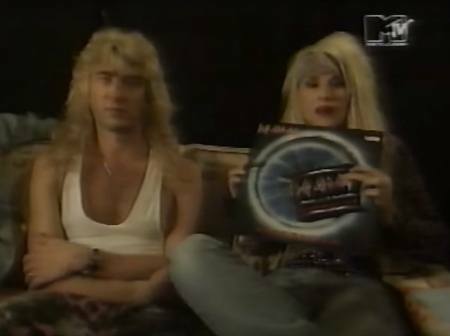 Joe and Sav talked briefly about picture disc releases on MTV in January 1993 with Headbanger's Ball host Vanessa Warwick. Vanessa Warwick - "We've got some limited edition ones to give away. Picture disc featuring ten tracks. And here's a gatefold CD which is a bit of a collector's item and it features two extra tracks. She's Too Tough and Miss You In A Heartbeat." "We're giving these away on the Headbanger's Ball. We're just gonna do a draw so if you send in a postcard to the usual address and mark your envelope Def Leppard Album Draw. We may pull five of you out of the hat. Send you these. They'll be autographed." "And actually that leads us nicely onto another question supplied by the Rock Squad. 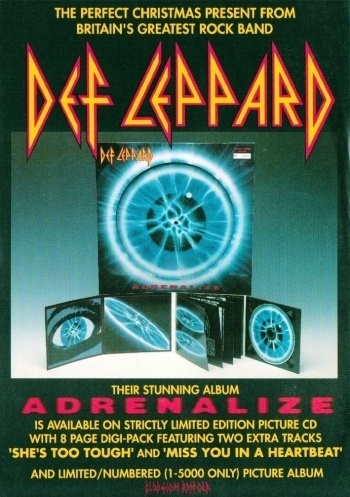 Where can fans obtain limited edition and picture discs so far released by Def Leppard?. Do you know the answer?." Rick Savage - "Well if I knew. If I knew the answer to that I'd get one myself. I was just thinking while you were talking about the CD. I'm thinking ooh that's a nice little collection 'cause I don't even have one. I think I'll send my postcard in and see if you can draw me out. It's difficult to say isn't it really Joe?." Joe Elliott - "If they sell out of the shops. Record Fairs, but you pay through the nose. There's always a possibility that if you write to the Rock Squad they can actually help out. And the thing is if there's any available you'll get them for the proper price and not some extortionate fifty pound out of somebody's car boot on a Sunday morning." Joe Elliott - "The thing is that they are a limited edition and it makes it difficult to get one for everybody that wants one. It's really difficult because normally you know there's maybe 10,000 of them made up but if there's 30,000 record shops. That's one copy to every three shops. Chances are the guy that runs the shop's gonna keep it you know." "But if it's any consolation hopefully one day all the tracks that aren't on the album that we've released, we may try and put together on a CD." A 12 track version of the original album housed in a digipak case. The case opened into four sections with extra artwork and live photos inside plus the original album booklet attached. The two extra tracks were the 1992 versions of 'She's Too Tough' and 'Miss You In A Heartbeat'. Although labelled in adverts as being strictly limited edition it was not numbered. A 10 track LP picture disc with the main album cover artwork on the front of the cut-out sleeve. Numbered and limited to only 5,000 copies. The two extra tracks were only available on the CD version.